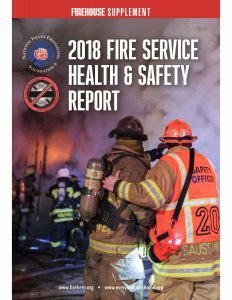 The September issue of Firehouse Magazine features the 2018 Fire Service Health and Safety Report. This 32-page supplement emphasizes the value of a progressive, safety-focused fire service culture, and provides information and resources to help firefighters implement the 16 Firefighter Life Safety Initiatives. The Philadelphia Fire Department is one of the organizations “Making a Difference” with its efforts to improve health and fitness, along with enhancing firefighter and officer development. Additionally, the report looks at the National Fallen Firefighters Foundation’s new partnership with the Wildland Firefighter Foundation to reinforce pertinent messages about risk management, wellness and safety. Get your copy of the 2018 Fire Service Health and Safety Report today. Pick up the September issue of Firehouse Magazine or download it here.